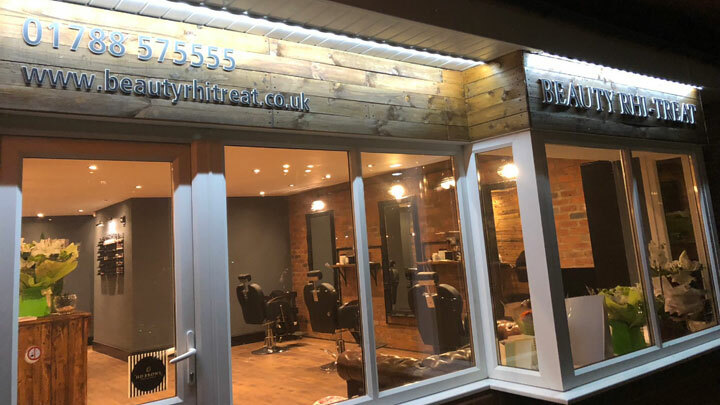 Beauty Rhi-Treat is a beauty salon located in the Brownsover area of Rugby, Warwickshire. Owned by experienced beautician Rhianna Davenport, who has previously worked for some of the UK’s top beauty product companies, even working as a UK wide spray tan trainer. Rhianna and her team are fully trained and insured in all areas of beauty, including nails, ear piercing, tanning, HD Brows and LVL lashes. Calms the mind, soothes the head and ears. Conditions which may benefit are compacted ear wax, ENT, headaches, tinnitus, vertigo, sinusitis, hay fever, snoring, stress neuralgia, Bell's palsy and much more. Includes a pressure point facial massage. This massage creates a balanced feeling of peace and calm, alleviates stress, anxiety, depression, the energy flow to the body and chakras are rebalanced leaving the person feeling revitalised. Benefits include relieving fatigue in muscles, circulation, lymphatic drainage, muscle tension, nourishment & much more. You know the feeling, you get home after a long day at work, and the only thing that you can feel is you back. Let us ease those aches away with our targeted back massages. Hot stone massage draws on Native American Indian traditions to give you a ten to fifteen times deeper massage than normal. Heated and cooled stones are used to enhance your emotional and physical harmony. This type of massage uses essential oils. It helps to control emotions and influence the nervous system. When essential oils are inhaled, messages are sent to the limbic system which can affect blood pressure, breathing, stress levels and digestion. Essential oils also have healing properties which can help soften and soothe the skin. ‍If you have never had a massage before, a Swedish massage is a good place to start. A 60 minute massage gives our therapists enough time to work the muscle tissue and achieve results. Deep Cleanse, Exfoliation, Facial Massage, Tone and moisturise with balm mint, cotton and aloe vera. Skin is calmed and soothed whilst being intensively nourished and moisturised using a calming combination of white nettle, mulberry and pomegranate. Deep shoulder cleanse, exfoliation, face neck and shoulder massage, mask, tone and moisturise. Perfect for combination to oily skin, removing impurities and rebalancing the moisture of your skin with willow bark, cucumber and mallow. Dermaplaning is a skin care treatment that removes dead skin cells and vellus hair. Dermaplaning leaves your skin brighter, smoother and glowing. Treating fine lines, hyperpigmentation and acne scars. Microneedling is a minimally invasive treatment where tiny punctures are created using micro-fine needles stimulating collagen and elastin productions. A luxury facial where science meets indulgence. Working your skin from the outside in, this treatment has been designed to deeply exfoliate dead skin cells and remove non terminal hair, polish the skin, flush toxins, increase and stimulate our natural collagen and cell turnover. This method will heavily increase the absorption of any active ingredients by 80% as appose to 8%, this is why we use hyaluronic acid mask for maximum results. The correct shape for a brow is personal to you and the dimensions of your face. The right shape can really open up the eye area and work to improve your faces symmetry. The perfect brow for you can make you look fresh, rested and healthy. We only carry out treatments that involve tints if there has been a 24hr patch test conducted. Pop in prior to your appointment, a patch test takes a second to apply behind the ear and left on for 24hrs to make sure you wont have any adverse reactions to any of the tints we use. A patch test is required 48 Hours Before Treatment Celebrity brow beauty is now within your reach. HD Brows is a 7 step eyebrows shaping treatment that focuses on design. It involves a combination of techniques including tinting, waxing and threading using specialist HD Brow products. We only carry out treatments that involve tints if there has been a 24hr patch test conducted. Pop in prior to your appointment, a patch test takes a second to apply behind the ear and left on for 24hrs to make sure you wont have any adverse reactions to any of the tints we use. ‍We only carry out treatments that involve tints if there has been a 24hr patch test conducted. Pop in prior to your appointment, a patch test takes a second to apply behind the ear and left on for 24hrs to make sure you wont have any adverse reactions to any of the tints we use. This exciting new treatment is the perfect addition to your brow sculpting service. Henna tinting 'stains' the skin more effectively than regular tinting and sets to a powder like matte finish that last 2-4 weeks depending on the skin type. Bring a friend along to both have LVL lashes together for £50. Simply put your friends names in the notes when making your booking. Don't forget to call in for patch tests. ‍Classic lashes are one extension applied to one natural lash only, therefore if you only have 50 suitable natural lashes per eye, then you will only achieve a look of 50 eyelash extensions, whereas if you have 100 natural lashes per eye then you will achieve a look of 100 extensions per eye. ‍Nouveau Lvl Lashes for you and 2 friends. Patch test essential, please add names to notes. Russian Volume is the use of multiple ultra fine extensions, that are hand created at the time of application by the therapist using their specially designed tweezers. The therapist skilfully creates bouquets of eyelash extensions that are then placed onto the natural lash in a fanned effect, to create extra fluff, coverage and fullness than cannot be created with classic extensions. Although we use multiple extensions, the fan is still placed onto one individually isolated natural lash in a method that encases the natural lash with great retention and zero damage Russian Volume is also suitable for the client who desires a more glamorous and thicker looking set than can be achieved with classic lashes. Gel polish application only. Semilac Cuccio veneer and Gelish. ‍Are you flip flop ready?? Callus Peel is a luxury, spa foot treatment that removes hard, callused skin leaving your feet feeling soft and revitalised. The treatment is a 15 minute process through five stages: Patch, Wrapping, Scraping, Filing and Creaming. ‍Gelish, Shellac, Cuccio Veneer on hands and toes including removal. Semilac, Cuccio veneer and Gelish. Gel polish removal, file and shape and nail strengthener. This treatment includes filing, complete tidy up, quick massage, exfoliation and gel polish of your choice to finish. A luxurious way to soften and moisturise the skin. ‍Acrylic Enhancements French or Natural available including nail art and gel polish. Solglo spray tan 8% or 12% It is advisable to wear loose dark clothes. Hair removal to be completed 24 hrs prior to tanning.